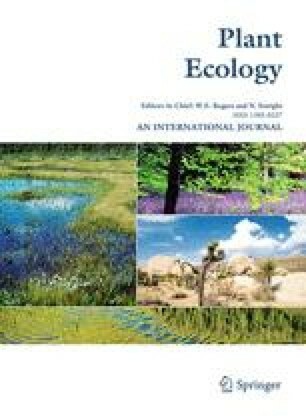 This paper reports on a detailed phytosociological analysis of forests in the NW catchment of the Gola River in Kumaun Himalaya, 29°19′–29°27′N and 79°32′–79°42′E. Fourteen sites and 56 stands at elevations ranging from 1200 to 2523 m and covering the following five forest types were investigated: Pinus roxburghii, mixed, Quercus leucotrichophora, Q. lanuginosa, and Q. floribunda. The basal cover of the forests differed according to slope position and aspect. The three oak forests had more basal cover than the other two, and Q. lanuginosa had the most. The performance of individual tree and shrub species and the number of saplings and seedlings differed according to slope position and aspect. The mixed forest had the greatest tree diversity, and among the others diversity increased with increasing basal cover. The diversity of trees, saplings, and herb layer was greatest on aspects with intermediate temperature and moisture conditions; whereas that of shrubs and seedlings increased towards the cooler (and wetter) and warmer (and drier) exposures. There was a positive relation between the diversity of shrubs plus seedlings and trees plus saplings in P. roxburghii and mixed forests; whereas this relationship was inverse in the three oak forests. In general, the dominance-diversity curves for the tree layer followed a geometric series conforming to the niche pre-emption situation in communities of low diversity. Among the forests, the regeneration was best in Q. lanuginosa and worst in Q. leucotrichophora. Finacial support from the Council of Scientific and Industrial Research, New Delhi and the Indian Space Research Organisation, Banglore is gratefully acknowledged.